From shorter days to low temperatures, smaller numbers seem to be the theme of the winter months. But that pattern doesn’t mean you can’t find big fun for the whole family during Jack Frost’s time of year. In fact, it takes a minimum of just 4 inches of solid ice* on a frozen lake, pond, or river to be safe for ice fishing. (*Make sure you read this article’s section on ice fishing safety*) And since all you have to do is drop your line in a hole in the ice, this season is all about short fishing rods. Meanwhile, the bigger rods required for cast, salt water, and fly fishing can be tucked away for a long winter’s nap and a well-deserved rest. Ice fishing is a fantastic way to spend some quality time outdoors with the whole family rather than hibernating until spring. At Campers & Gear, we believe that life should be lived outdoors and we hope to help you live the lifestyle year round. That is why we have put together the necessities of what you need to know to get out on that 4 inches* and reel in some great memories. Take some time to get educated on the ice fishing regulations, license requirements, limits, and species of fish for the waterway you plan on ice fishing. A local bait shop, outfitter, or reputable fishing guide can help you with this. Some of the common species caught while ice fishing include lake trout, perch, walleye, bluegill, and crappie. Keep an eye on the weather forecast and respect the changing moods of Mother Nature. Dress appropriately! Layering is always ideal for winter activities where factors like exertion, temperature, wind speed, and sunlight change throughout the day. Live bait like wax worms, minnows, and dare we say maggots are optimal for beginners. 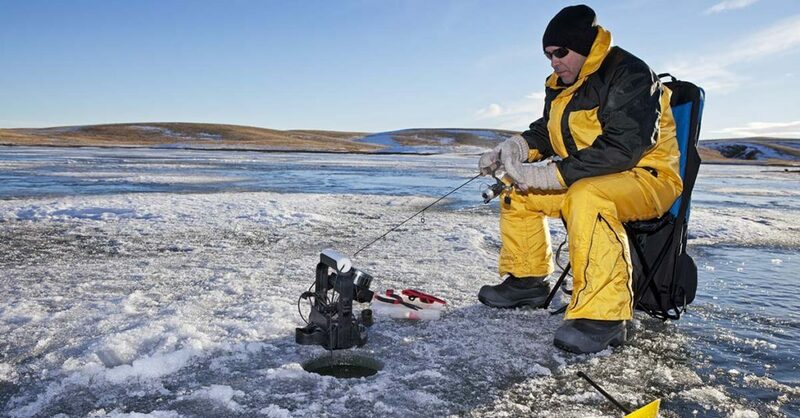 After testing the ice and setting up your ice fishing spot, drill your hole with either an electric auger or a hand auger by applying pressure and using caution. Drop your line and after it sinks to the bottom, reel it up a couple of feet. Wait to see if anything bites. If after a while you don’t get any action, reel it up a couple more feet and wait. Continue this process until you get some action from the fish. Remember that fish are less active in winter and the bites will be light. Find out where the weed beds are and start in that location. Some areas have seasonal “Shanty Towns” made up of semi-permanent shacks for ice fisherman. Some of these ice angler camps have vendors that sell bait and other tackle as well as food and drinks for the fisherman. (Think the movie Grumpy Old Men) Many ice fishermen have shelters with stoves and furnaces and other creature comforts. Be patient and enjoy the fresh air and unique scenery that a day of ice fishing provides. Ice fishing gear should be kept to a minimum. Ice fishing rods are best when they are short (as there is no casting required) typically 3 to 4 feet in length and sensitive. A graphite or fiberglass rod will work well in the cold yet remain flexible. 8 pound line is all that is needed for most of the species you will be catching. Spincasting or ultralight spinning reels are best. If the cold temps have you feeling lazy, try a tip-up instead of a rod and reel. Tip-ups are contraptions that sit above your hole and hang bait beneath it and have a flag to let you know when you have a bite. They have a small reel beneath the water and the flag “tips up” to alert you to fish activity. If you don’t want to use live bait try banana jigs or teardrop jigs with a plastic lure. If you ice fish in different locations rather than at a “Shanty Town”, portable tent-like ice fishing shelters are available from a variety of manufacturers and to fit many different needs. On the lower price end, one can purchase a basic ice fishing shelter for just over $100. The more serious you get about ice fishing, the more serious the shelters can get. For just a few dollars you can get yourself a fishing rod tip bell which acts as an alarm to let you know when you have a fish on. These come in very handy if you are distracted by other activities. Clear, newly formed ice is strongest. A minimum of 4 inches will support one person. Older, partially thawed ice needs to be much thicker, and we recommend you avoid it. Ice thickness usually varies from one spot to another. Take extra precaution ice fishing on flowing waterways like rivers and streams and stay clear of river bends and away from culverts and bridges. Snow means slow. Snow has an insulating factor that delays freezing. Snow also can weigh a lot, meaning ice covered in snow cannot hold as much as clear ice. Figure needing 8 inches of ice thickness for snow ice or white ice. No matter how thick the ice is we don’t recommend driving a vehicle onto it. Check ice thickness with a cordless drill with a long bit. Use caution at all times, refrain from alcohol or other substances that might impair your judgement. Wear sunglasses and sunscreen with good UVB protection. Outdoor activities like ice fishing can make the winter months a whole lot of fun. A reputable fishing guide can make your ice fishing experiences even better. And the right measures of preparedness and precaution will keep you and your companions safe. Now get out there and triumph over the winter blues! Here are a few helpful links you may be interested in.